Rishabh Pant and Ambati Rayudu have missed out on India's Cricket World Cup squad, with Vijay Shankar set to receive a prominent role. Pant is India's Test wicketkeeper but he has not been included in the ODI group travelling to England, with Dinesh Karthik preferred to play back-up to MS Dhoni. And according to chief selector MSK Prasad, it was Pant's glovework that saw him miss out, with recent strong performances with the bat in the longest format not enough to secure a place. "Wicketkeeping also matters," said Prasad. "That is the reason why we went with Dinesh Karthik, otherwise Rishabh Pant was also there." The number four spot has been an issue for India of late, with Shankar set to compete with KL Rahul for the position. Captain Virat Kohli had previously suggested Rayudu was in line to take up the role, but he has missed out on the squad completely. "Since the Champions Trophy, we have tried quite a few middle-order batsmen, which also included Karthik, Shreyas Iyer, Manish Pandey," Prasad said. "We did give a few more chances to Rayudu but Vijay Shankar gives three dimensions. He can bat, he can bowl if the conditions are overcast, plus he is a fielder. "We are looking at Vijay Shankar as a number four. Now we have plenty of options for that slot." The rest of the squad is as expected, with Kohli leading a group that includes Rohit Sharma, Jasprit Bumrah and Bhuvneshwar Kumar. The ICC still allows teams to make changes to their final squads up until May 23. India squad in full: Virat Kohli, Rohit Sharma, Shikhar Dhawan, KL Rahul, Vijay Shankar, MS Dhoni, Kedar Jadhav, Dinesh Karthik, Yuzvendra Chahal, Kuldeep Yadav, Bhuvneshwar Kumar, Jasprit Bumrah, Hardik Pandya, Ravindra Jadeja, Mohammed Shami. 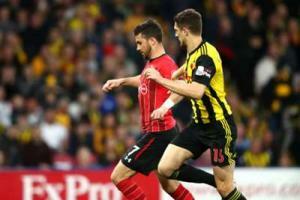 Southampton's Shane Long scored after just seven seconds in his side's Premier League game at Vicarage Road.